Sakura (her cute outfit), Tomoyo, and Syaoran ( especially Syaoran <3 ) look adorable. Yue, his usual expressionless self. <3 I would so stick to these art than the Tsubasa one. The outfits on both are beautiful but I feel decadency in the anatomy. I'd always really liked this picture from all the cast, the artwork is so fine and colors are bright! 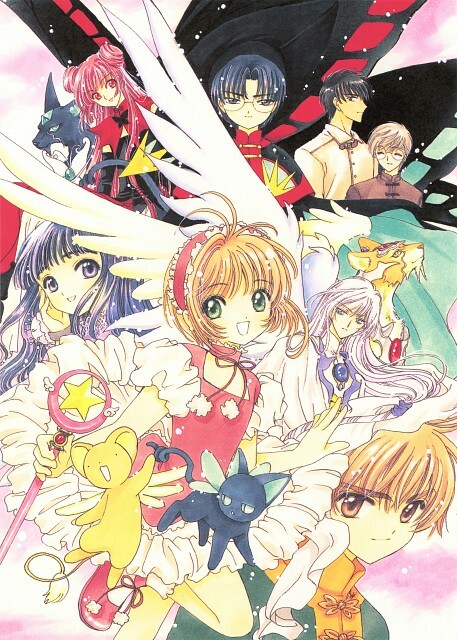 This is one of my favorites images from CCS artbooks. Syaoran's expression is priceless *sigh*! this is a great scan it has everyone in it! 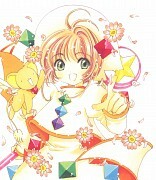 for me, this is the best CCS pic! thanks for sharing! thanks for sharing this picture! i had a poster of this, but it is far more better. i like this scan thanks for sharing. I realy love this beautiful scan, thank you!